I just turned the knob on my GE stove/oven and the temp knob is just spinning and not turning. I pulled the plastic knob off and the piece that the timer shaft goes through is broken. How do i go about with a replacement? Do I need the knob or the part that controls the actual temperature? I have to cook food for many people ASAP. I need advice on fixing this! Replacing your Stove Oven Knob is super easy. We will tell you how to go about ordering a new one below. But first, to get the stove or oven to work for now to cook, get a pair of pliers, remove the knob, and grab the temperature knob shaft. Get a firm grip and turn the pliers in the direction (HIGH or LOW temp) to set the temperature to the appropriate heat. This should make it possible to cook in the meantime. To attempt to fix the cracked or broken plastic knob yourself, you can use epoxy glue. Apply the epoxy to the cracked area of the knob and hold it together while drying with a pair of needle nose pliers. Hold the plastic together for the amount of time the epoxy instructions advise you. Once the glue is dry, slide the Stove Oven Knob back onto the shaft. Test the knob by turning it. Whether this has worked or not, it is best to purchase a new one for your stove or oven as the repair you just made will not usually hold for long. 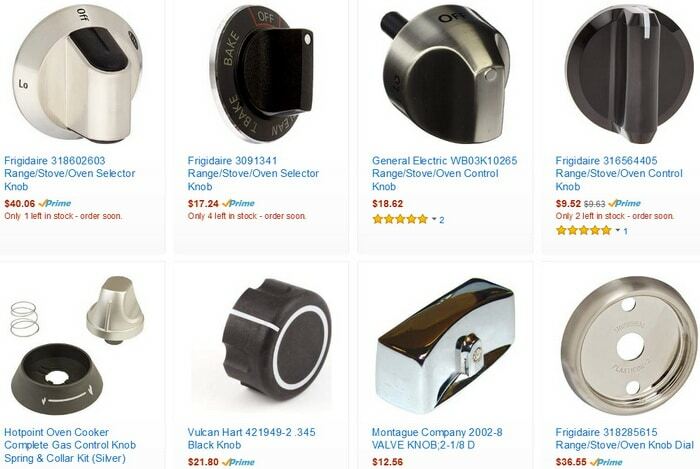 Probably the easiest and cheapest way to buy a new dryer knob for your GE, Kenmore, Whirlpool, Frigidaire, Electrolux, Hotpoint, or Maytag oven or stove is through Amazon. The knobs available are inexpensive and usually aftermarket but look the same and function the same as the original. The prices are relatively cheap ranging from $5 to $12 dollars depending on your brand of oven or stove. Click here to see the page where all of the Stove Oven Knobs are listed and available for your oven/stove. Replacing the Stove Oven Knob should take merely seconds. The new one you purchase will slide onto the shaft with ease and your oven/stove should be as good as new. You can then begin using your oven/stove immediately. If your Stove Oven temp or setting assembly is the issue, see below. If the Stove Oven Knob is NOT cracked but the shaft on the timer or temp control has broken or will not turn, you will need to buy a new Stove Oven temp or setting assembly. Replacing the Stove Oven temp or setting assembly is not as easy as replacing the knob but by following the instructions it can be done by almost anyone. The easy way to buy a new Stove Oven temp or setting assembly is through Amazon within the category of “Stove or Oven Parts & Accessories”. Have a look here to find the Stove Oven temp or setting assembly that will fit your model. Most Stove Oven temp or setting assembly will cost between $40 and $100 dollars depending on your brand. This may seem expensive but consider calling a repairman that will charge $200 just to show up! Doing this job yourself will save you money and get you more comfortable with doing home repairs. Next post: I Lost My AC Remote Control – Where To Find A Universal Air Conditioner Replacement Remote?